It’s all about the light, natural light of course. It changes everything. Sometimes it takes a day, sometimes just a second. Mostly it’s a matter of minutes that the world around you has changed in new shape. The world of Sedona, Arizona. I’ve been there more than a dozen of times since my first visit in 1986. The place was just a cosy little village, not even incorporated, at the crossroads of Highway 179 and 89A up there in Northern Arizona. The family I stayed at that first visit, Marianne and Jack, lived in a quiet neighborhood at the South end of the village around Coffee Pot Rock. All the streets were named after wellknown national coffee brands, so directions were easy to ask for. At the corner to 89A was a cleaner’s shop where I brought my laundry and got all the background information about the place which a native could give. At our last farewall he presented me a worn out state flag (he did the cleaning on them, too), which still graces my writing place. We did a lot of hiking aorund the area, something I repeater as often as possible when I returned: around Red Rock Crossing, up steep and rocky Schnebly Hil Road, back to the Indian ruins at Palatki. Not to forget a fast and refreshing ride down Slide Rock. Those hikes were really appetizing, first for water (even experienced European Bergsteiger suffer from the dry air here) than for some hearty food. They told me later that the 42 all-you-can-eat ribs at „The Hideaway“ that evening after Palatki were kind of a house record. Comebing back and puting on the boots again and again was not for the hike, it was for the adventure of a natural landscape that was never the same as the last time. The light and the colours. Different from Southern parts of Arizona the red colour of the rocks is matched by a wealth in green up here in „Verde Valley“ most time of the year which switches in to flaming colours during fall. Every season, every time of the day it gives ne thrills to our eyes. As a photographer you get desperated. Especiall at those times before the digital age, when you had to carry rolls of film. There was no chance not to run out of it. Because just a few steps after one had shot the „perfect picture“ ouy found a new promising perspective, a new angle – a new light. So I kept the most pictures not on film but in mind, which actually has magnetic effects to come back to the original scene. Sedona has developed a lot over those years. It even got incorporated. The fact that, as experts say, one of the most powerful vortexes on the planet is located here, has been attractive to people with high spirituality already in 1986. Their number, added by crowds of esoteric believes in most different degrees, has filled the place and spread the word about its beauty. The nature lovers were joined by Spa enthusiasts who preferred the cool climate up here to the desert area in the Southern parts of the state. Meanwhile Sedona is an acronym for vacations in relaxed and comfortable style surrounded by spectacular landscape. Nevertheless there is still a lot of space for the unsophisticated, individual traveller. Especially in spring and fall you’ll make your own way easily and find plenty of quiet spots. Even the picturesque little shop-and-gallery „village in the village“ named „Tlaquepaque“ has some free seats at its tables then. In the sunny season the rocks around Slide Rock are heated up enough to get you dry even after a late evening slide. 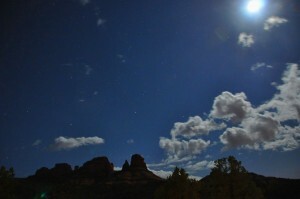 Don’t miss the chance to skygaze afterwards – the scenery about Oak Creek Canyon is overwhelming. A good spot to get an overlook over the area, if you are not even flying in by yourself, is Sedona’s Airport. High above the valley on top of a Mesa the approach is as challenging as on an aircraft carrier, pilots say. Among them you’ll find future captains of Lufthansa, who have their school in Goodyear, Arizona, and love to circle to the North and ride the gusty upcurrents and fall winds over the red valleys. Watching the final approach of the planes to the runway is a sight by itself – if you can draw away your eyes from the rocks and rivers down the hill. During my last visit we stayed in a part of town where 27 years ago literally was a „tiera di nadje“ and which is a vivid settlement of its own: the „Village of Oak Creek“. The Hilton Resort & Spa there is a very recommandable place with good service, an invitating menu and a fine spa. 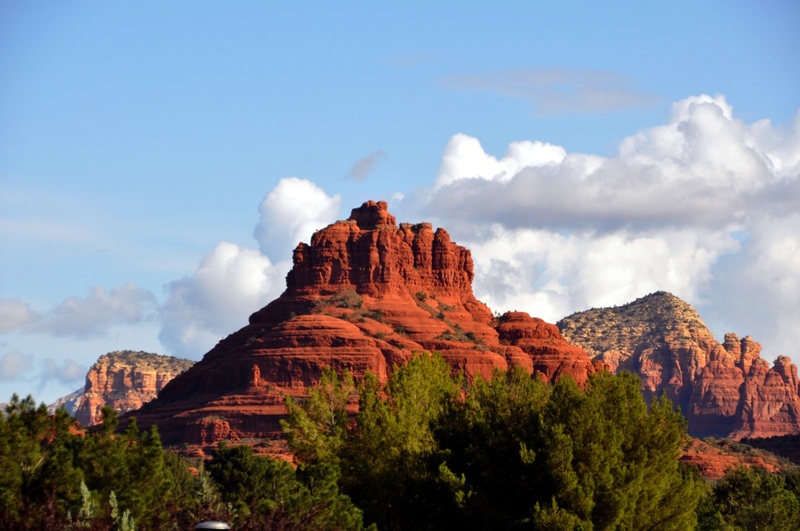 It will serve you well for an extended stay, which Sedona is always worth for. Give the area a week plus, including day-trips to Flagstaff, to the Gran Ganyon, to Jerome and to the ruins of Tuzigoot and Montezuma Castle – all of them in easy reach. And stay the Saturday either on your bicycle or out of town, as the roads will be crowded during the day. Unerbittlich sorgten einst US-Marshall Matt Dillon (James Arness) und sein Hilfssheriff Festus Haggan (Ken Curtis) als Titelhelden der am längsten gelaufenen TV-Westernserie überhaupt, „Rauchende Colts“ („Gunsmoke“), zwischen 1955 und 1975 in Dodge City für Recht und Ordnung. Zwischen 1967 und 1997 liefen 228 Folgen in Deutschland, 635 in den USA, und dazu wurden fünf Spielfilme gedreht. „Gunsmoke“ und der Western „Dodge City“ (1939) mit Errol Flynn und Olivia de Havilland haben dem 28.000-Seelen-Städtchen im Südwesten des US-Bundesstaates Kansas seinen Stempel aufgedrückt. Gegründet wurde Dodge City 1871 und schon bald war es als Rinder-Verladebahnhof bedeutend. Bis in die 1890er-Jahre hinein trieben Cowboys Rinderherden auf den legendären „Cattle Drives“ hierher – Spuren der Viehtriebe sind entlang dem Hwy. 50 erhalten – und es entstand eine entsprechende „Infrastruktur“ mit Saloons, Bordellen, Bars und Hotels. Das Bemühen der Stadt, ihre Vergangenheit zu wahren, zu pflegen und zu neuem Leben zu erwecken, honorierte das Fachmagazin „True West Magazine“ nun in seiner Januar-Ausgabe. 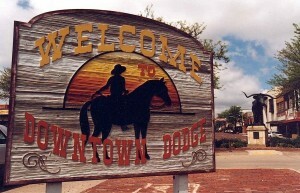 Unter den seit 2006 alljährlich gekürten „Top Ten True Western Towns“ findet sich heuer Dodge City hinter Fort Smith (Arkansas) auf Platz 2. Mit dieser Nominierung werden bekannte, aber auch relativ unbekannte Ortschaften im modernen „Wilden Westen“ Nordamerikas ausgezeichnet, die ihr historisches Erbe mustergültig bewahrt haben. Zum achten Mal gaben die Herausgeber des „True West Magazine“, das 2013 seinen 60. Geburtstag feiert und sich ganz dem „Wilden Westen“ früher und heute verschrieben hat, seine Top Ten bekannt. Etwa 150.000 Besucher erleben jedes Jahr in Dodge City Geschichte hautnah. 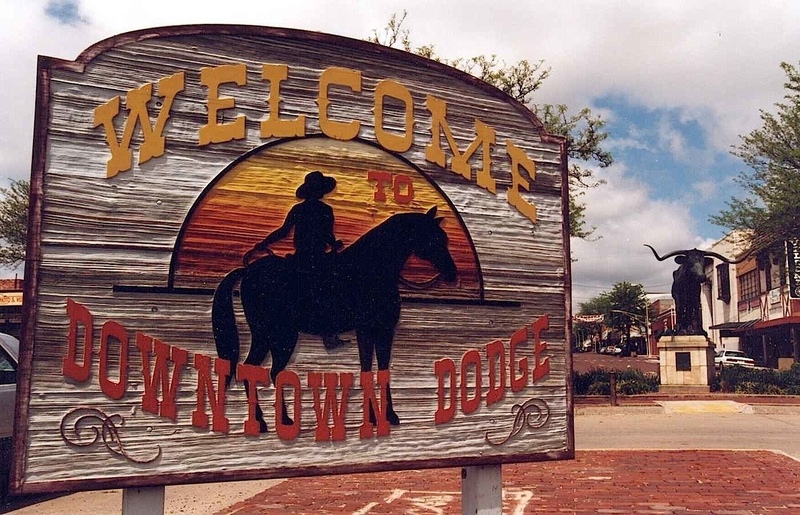 In der Altstadt von Dodge City sind historische Bauten wie das George Hinkle House (ca. 1880), die First Presbyterian Church (1880) oder die St. Cornelius Episcopal Church (1898) erhalten, aber besonders im Boot Hill Museum erwacht die Wildwest-Vergangenheit zu neuem Leben. Während der Dodge City Days, einem zehntägigen „Western-Fest“ Ende Juli, treffen sich in der Stadt Cowboys und Cowgirls zu einem großen Umzug, Rodeos, Barbecue-Kochwettbewerb, Western Art Show und anderen Vergnügungen.